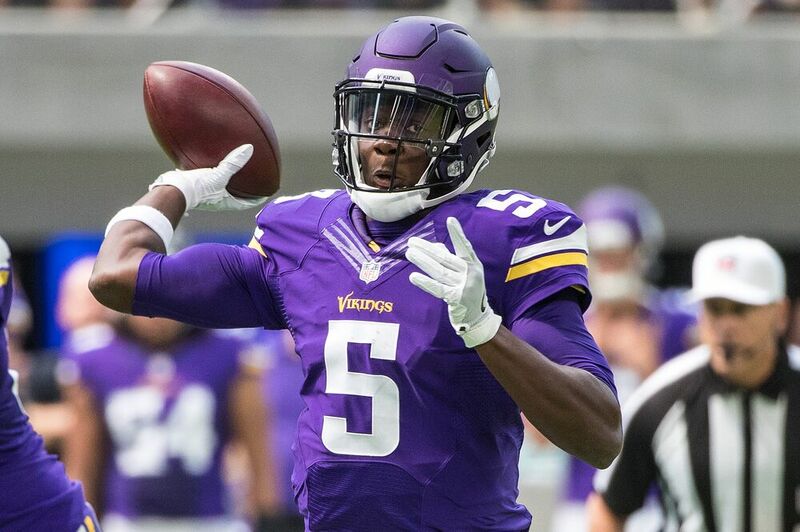 Teddy Bridgewater seems to be making fantastic progress in his recovery from a significant knee injury, but the Minnesota Vikings can afford to be patient. Since Teddy Bridgewater went down with a substantial left knee injury late last preseason, mum has mostly been the word from the Minnesota Vikings about his status. The injury forced a trade for Sam Bradford, who played solidly behind a porous offensive line on his way to setting an NFL single season record for completion percentage (71.6 percent). In late March, Bridgewater posted a video of himself throwing in a city park or something. More recently, the team posted a video of him dropping back and throwing on the first day of OTAs on Tuesday. Bridgewater was not on the field Wednesday when the media got to look in on practice, since he was at a rehab appointment with a doctor. He is not yet cleared for practice, and it’s not clear when he will be, but the doctor visit brought good news. Bridgewater has been cleared for the next step in the rehab process, including side-to-side movement. That sounds like a fairly small thing, but with Bridgewater suffering a torn ACL, MCL and a possible dislocation in his leg, to the point Vikings’ head athletic trainer Eric Sugarman was credited for his fast action at the time of the injury, being able to move sideways is a major positive step. It’s easy to assert that Bridgewater is progressing toward a training camp competition with Bradford for the starting job. But Vikings’ general manager Rick Spielman was clear on Wednesday that nothing is certain, including Bridgewater even playing again. “This entire organization (is) just hoping that eventually he’ll be able to come back on the field, but that’s still the unknown,” general manager Rick Spielman said Wednesday. It’s easy to dismiss Bradford’s performance last season. A measure of self-preservation led to short passes and a high completion percentage, but not a lot of wins after a 5-0 start. But a full offseason working with offensive coordinator Pat Shurmur, who he is familiar with from their time together with the Rams and Eagles, sets up a good situation for this year. Part of the appeal of trading for Bradford, at the time, was that he had two years left on his contract. That covered the Vikings in case Bridgewater’s status was at all in doubt heading into the 2017 season. It clearly is, and will be until further notice, so barring an injury of his own Bradford should be under center all season. Bridgewater needs to be brought along slowly, OTA hype videos aside, and the Vikings have the ability to be patient.